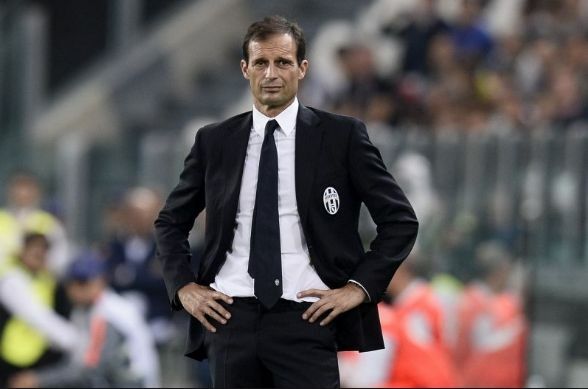 Going into the game 3 points clear of Napoli, this game posed a huge opportunity for Allegri’s men to pull clear of their biggest challengers last season. Napoli moved away from the 4-3-3 that had served the side so well under Maurizio Sarri by reverting to a 4-4-2, pushing Insigne central alongside Mertens and playing Allan and Hamsik in the centre of the park with Callejon on the right and Zielinski playing as an unconventional wide player. It was the usual back four with Rui still at left back while Ghoulam continues his absence. Juventus approached the game with a more versatile system, as they started the game with a 4-1-2-1-2 diamond with Cancelo and Sandro providing the width from full back. Panic playing as the deep lying regista, with Can and Matudi either side of him while Dybala played ahead of the midfield three. Ronaldo played more as a wide left forward, drifting over to the left at the start of the game, whilst Mandzukic started centrally. From the start of the game, Napoli sort to press Juventus high and stop them building out from the back. As Pjanic dropped into a deeper position to collect the ball, either Mertens, Insigne or Hamsik would apply pressure straight away to stop the Bosnian playing forward passes. What this resulted in was a lot of balls played back to Bonucci and Chiellini and this is where the Napoli goal came from, as Zielinski and Insigne pressed high on Bonucci whose pass into Pjanic went astray being intercepted by Allan whose ball into Callejon led to Dries Mertens slotting the ball into the empty Juventus net. Juventus then reverted their defensive shape, moving Mandzukic out to the left, Can sitting the right, with Dybala dropping behind Ronaldo to create a narrow 4-4-2 system when Napoli had the ball. This stabilised Juventus defensively, as during the period of play when Juventus played the diamond system, Hysaj and Rui were able to advance into the wide spaces as Callejon’s width pushed Sandro back and Can and Matuidi were too narrow to cover. This essentially led to Napoli being able to exploit the space behind Can and Matuidi when the pressed the full backs. 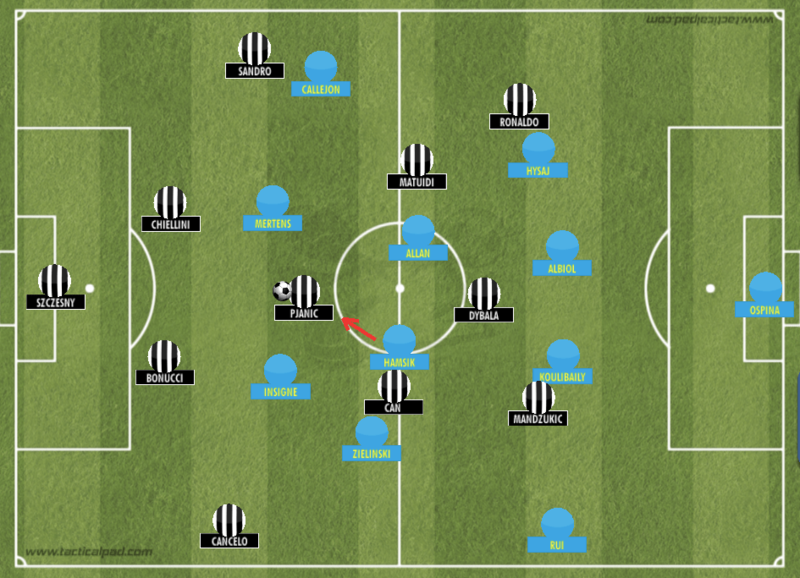 Playing the 4-4-2 allowed Dybala to sit deep on Marek Hamsik, it allowed both Can and Mandzukic to cover the wide positions. This stopped Napoli from playing balls into the half space between Juventus’ wide central midfielder, the full back and Pjanic. At this point Ancelotti should have reverted to a 4-3-3, pushing Insigne out the wide left, thereby stretching Juventus’ narrow four in midfield. By sticking to the 4-4-2, Napoli lacked width on the left hand side. Zielinski, a naturally central midfield pushed in narrow whilst Rui did not advance ambitiously, thus allowing Juventus’ system to remain compact. Had Insigne reverted to his usually position he may have been able to find great space out wide then he did centrally, also allowing Zielinski to move into his traditional centrally advanced role. Ronaldo was excellent throughout the game, looking bright and powerful as he played off of Mandzukic. His run down the left and cross for Mandzukic’s headed goal showed his creativity that he can exert when being given a free role across the front line. Cancelo continued his fantastic form as he provided the width on the right, which was key for Juventus who were playing without a dedicated right winger. His dribbling, pass choice, movement and crossing caused Napoli’s left handside problems throughout the game. Allan was key in Napoli’s midfield. He was industrious in winning and intercepting the ball to launch Napoli’s counter attacks. The Brazilian’s ability to move past players with the ball was key in moving Napoli into advanced areas, a role similar to that of which Hamsik played in recent years under Sarri. In the second half Napoli’s press became disjointed as the energy shown in the first half seemed to have been sapped over the game. Pjanic was allowed more time on the ball as Hamsik struggled to continue his press on the deep lying playmaker. 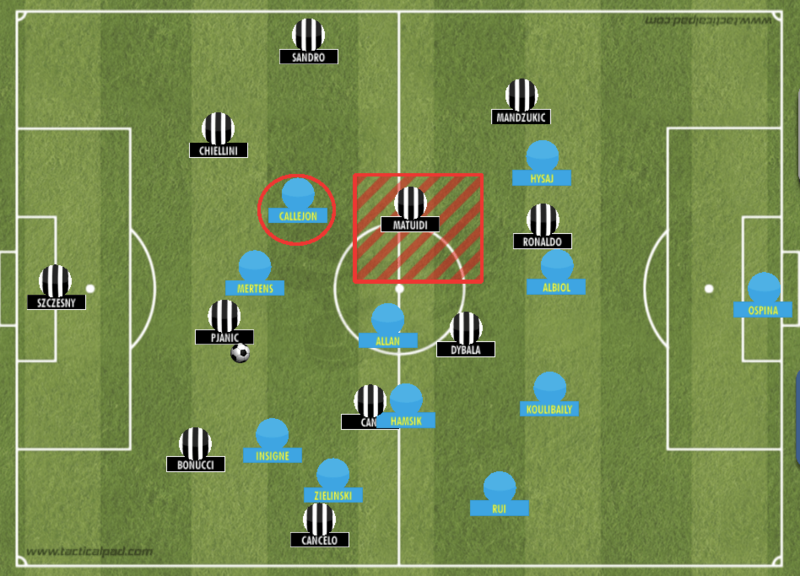 Thus, Matuidi and Dybala were able to find space either side of Hamsik and Allan throughout the game, as both Zielinski and Callejon advanced to press the Juventus full backs leaving the Napoli Central midfielders with gaps to cover. Matuidi’s pace and power was key in this part of the game as when Pjanic found Matuidi in these gaps he was able to carry the ball and create a 3 vs 4 with Mandzukic and Ronaldo up against the Napoli back four. In this situation, Ancelotti should have been played a 4-3-3, as the three central midfielders would have been able to fill these gaps better than Allan and the tiring Hamsik could have. After Marco Rui’s second half red card, Napoli were really on the back foot. Ancelotti brought. On Milik and switched the system to a 4-2-2-1 with Malcut and Hysaj playing almost as wing backs to provide width. Hamsik and Allan sat in the centre of midfield and Insigne and Callejon played in a front three with Milik. Though this was an offensive change, Napoli were unable to create any key chances, as Allegri essentially locked off the game my keeping the midfield conservative and narrow. The game finished 3-1 to Juventus, with Ronaldo by far the best player on the pitch. Mandzukic’s two goals put the icing on his hard working performance, while Pjanic and Cancelo were key as the Bosnian provided Juventus with a Mechanism to turn the transitional phase of possession into the attacking phase with Pjanic’s excellent passing, whilst Cancelo’s threat out wide made up for the lack of a traditional winger in the Juventus system. Napoli, whilst still a threat to Juventus, don’t quite have the same speed in transition from possession to the attacking phase. Insigne playing a central role did not suit his attributes as when he plays out wide and moves inside he finds a greater amount of space, rather than being crowded out centrally. The lose of Jorginho also seems to be hurting Napoli, as Hamsik doesn’t quite have the same vision when it comes to creating attacking movements from deep.